This site marks the birthplace of the Anglican Church in Western Canada. 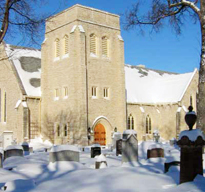 In 1812, the first group of Selkirk Settlers established a burying ground immediately south of the present Cathedral. The Rev. John West, the first Anglican Priest in Western Canada, arrived from England under the auspices of the Church Missionary Society, and the Hudson’s Bay Company in October, 1820. Two years later he constructed a Church Mission House near the south-east corner of the present cemetery. In 1833 it was replaced by a second church built on the site of the present Cathedral. This second church became the first Anglican Cathedral in Western Canada soon after the first Bishop of Rupert’s Land was consecrated in 1849. The third church on this site was built in 1862. Under the guidance and inspiration of the late Archbishop Samuel P. Matheson the present building (the fourth church) was reconstructed in 1926 using most of the stone from the previous building. It was regarded by him as a tribute and memorial of his predecessor, Archbishop Robert Machray. Archbishop Machray, who succeeded Bishop David Anderson in 1865, gave unsparingly of his time and talents to St. John’s and the Diocese of Rupert’s Land for almost forty years. In 1893 he became the first Primate of the Anglican Church of Canada. Take a tour of The Cathedral.